As the Narendra Modi government completes one year in office, Rediff.com speaks to eminent personalities to analyse the first 365 days of the government. "The BJP government is no better than the Congress -- as wretched and anti-people. In addition, it is explicitly and aggressively communal," says Venkatesh B Athreya (bottom, left), in a hard-hitting interview to Shobha Warrier/Rediff.com. Athreya is an advisor on food security at the M S Swaminathan Research Foundation. 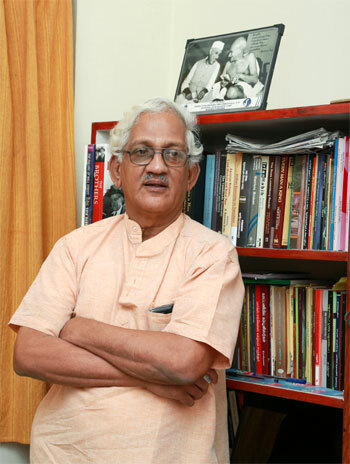 Earlier he had served as a professor of economics at the Bharathidasan University for nearly three decades. He is a regular contributor to the Economic and Political Weekly and also a co-author of books like Barriers Broken (with Djurfeldt and Lindberg), Literacy and Empowerment (with Sheela Rani Chunkath), etc. He was also the lead author of The Report on the State of Food Insecurity in Rural India (2008) and The Report on the State of Food Insecurity in Urban India (2010). In this interview with Shobha Warrier/Rediff.com, Athreya analyses the Modi government’s economic policies. 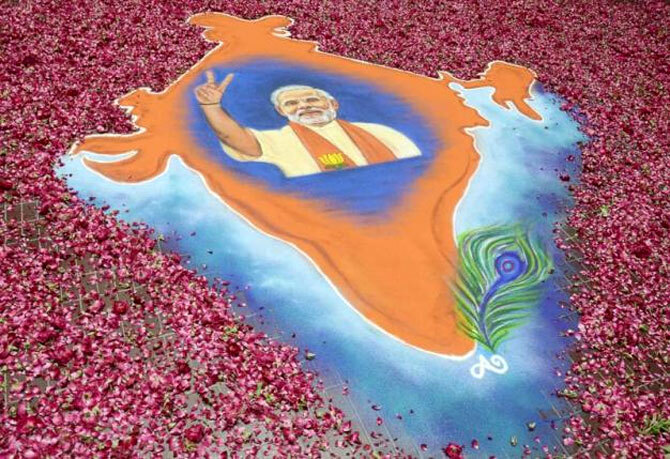 Many surveys reveal that people are, in general, satisfied with the performance of the Modi government. How do you respond to this? Who are these people? I think the media constructs a populace which is different from the real population. The media is only talking to businessmen, high profile entrepreneurs, and public figures. What about the huge middle class population of India? The middle class is a very amorphous category. While the middle class voted out the Bharatiya Janata Party in Delhi, it is the very same middle class that voted in large numbers for the BJP in the Lok Sabha election. The middle class did buy Modi's slogan of development and thought he wouldn’t push his other slogan -- that of Hindutva. In the election campaign, there was this dual strategy -- that Modi would talk about vikas and all his minions would talk about the Hindutva agenda. He himself was not above it, he went to West Bengal and raised the issue of Bangladeshi refugees. The BJP was quite explicit in its manifesto that India would be a home for the Hindus who faced difficulties outside the country! They didn’t say Indians, they said Hindus. The BJP never hid its communal identity. It uses religion as a political card. Modi as the prime minister never spoke about Hindutva but he never condoned atrocious statements by BJP leaders like Sakshi Maharaj who is a member of Parliament. The corporate control of the media is so extensive that they push certain perceptions of the people. To some extent, a large section of the middle class, the educated ones, benefitted to some extent, from the liberalisation policy. But if you take the majority of the Indians whose livelihood depends on agriculture or petty trade or labour, they are not any better off despite the higher GDP growth. Some of the growth rate figures are spurious and misleading. Those who play the stock market have done well but the same is not the case with the industry. The US dollar has gained against all currencies except the Indian rupee. Rupee has gained against the dollar…. This is a correction. When the rupee started soaring against he dollar, the Government of India panicked and removed every restriction on foreign investment. The reason Indian rupee improved in between has nothing to do with Modi. It has to do with the increased inflow from FIIs into the stock markets. That is because India is offering better rates when the global economy is not doing well. But investment in the manufacturing sector or any other sector like infrastructure or the flow of FDI has not shown any increase though there is plenty of talk about money coming to India. But is it not the government’s duty to invest in India’s infrastructure? Nitin Gadakri is talking about investing Rs 3 lakh crore in building roads in the next six months. There is a difference between rhetoric and action. What are the three things the government admitted it did before the Budget? They claim credit for moderating inflation which was in fact due to the decline in international oil prices. They restrained the MSP for farmers and cut back expenditure on rural employment scheme. As a result, the rural labour market is more slack now and rural wages are stagnated. So you achieve some reduction in the rate of inflation by attacking the livelihood of the majority of the people. So what kind of mirage are you taking about? Now you have the land grab bill. The government says it will benefit the manufacturing industry and will create employment. They also say that land will be acquired only for public purposes and not for any private business. Do you really feel it is against the interests of the people? The question is, who is it for? Do not forget that the BJP as part of the opposition, contributed to the unanimous passage of the bill in 2013. The only political party that was not satisfied was the Left but they also finally voted for it. Within eight months, the BJP made drastic changes. The whole land acquisition bill is part of the payback to the corporate. What has the government done in the last one year? They have cut down sharply on the MSP offered to the farmers, and reduced subsidies across the board including energy, fertilisers, etc. Along with bad weather, this has resulted in tremendous amount of debt for farmers. So there is a spate of farmer suicides in all the states. Maharashtra is busy banning beef but doesn’t care about farmer suicides. Look at Didi’s West Bengal, with all the hostile media the Left front had all these years, there was not a single farmer suicide when the Left was ruling the state. So politically also, the land acquisition bill was badly timed. Framers are in crisis. The expose by the media of the UPA 2 contributed a lot to the victory of Modi. The way the media presented the victory of Modi was absurd. They called it an overwhelming mandate. Do you call getting 31 per cent votes overwhelming? Many economists are of the opinion that as agriculture is not doing well, we should start providing them jobs in the manufacturing sector, and for that to happen, industries have to come. So they say land acquisition for the manufacturing sector is essential. What do you say about this argument? There are economists and economists. The pro-corporate ones get quoted in the media. The English media and readers are still hoping and dreaming that India’s growth lies in the investments of the big MNCs and big Indian corporate. Arvind Panagariya wrote the other day that we need to move people into the manufacturing industry. Who will fund the industry? No one is saying that people will have to remain in agriculture always. There was a transition of the labour force from agriculture to services and not to manufacturing as there was hardly any growth in the manufacturing sector. Manufacturing accounts for just 16 per cent of India’s GDP, while it is 37 per cent in China. Korea, China, Japan etc have promised billions of dollars as investment in India. Are you against foreign investment? I have nothing against them investing in India. If some investment from abroad comes and creates employment in the manufacturing sector, why would I object to it? I want to say, do not completely remove the rights of workers to get some investment from abroad. But is there any increase in employment? Money coming to stock market will not create employment. How do you describe the last one year? It was no different from the UPA’s. Even if there is an improvement in the growth rate, it is not because of the Modi government; it is because of the decisions taken by the previous government as there will be a lag to see the results. It is no better than the Congress government -- as wretched and anti-people. In addition, it is explicitly and aggressively communal. The Modi government says the last one year had been an year without any corruption..
Look at Gadkari, there is a huge corruption charge against him. Parliament was stalled because of that. It is the joke of the century, if the BJP pretends that it was a clean government.